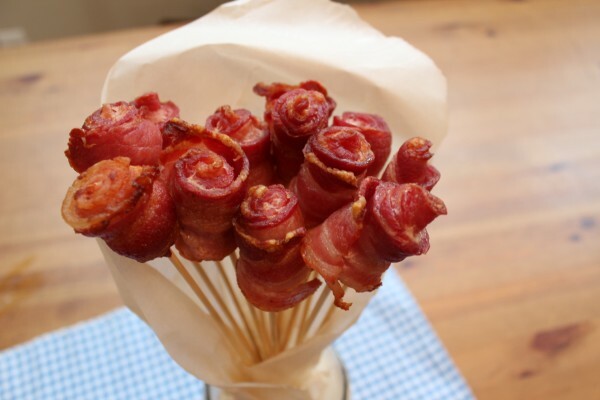 Bacon roses are super fun to present to your favorite meat-lover. If you or someone you know is avoiding sweets, but you still want to treat them for Valentine’s day, this is the perfect solution! These look like they would be complicated to make, but in reality after you alter your muffin tin, you can have a dozen popped in the oven in no time flat! You need to poke a hole in the bottom of each muffin cup. 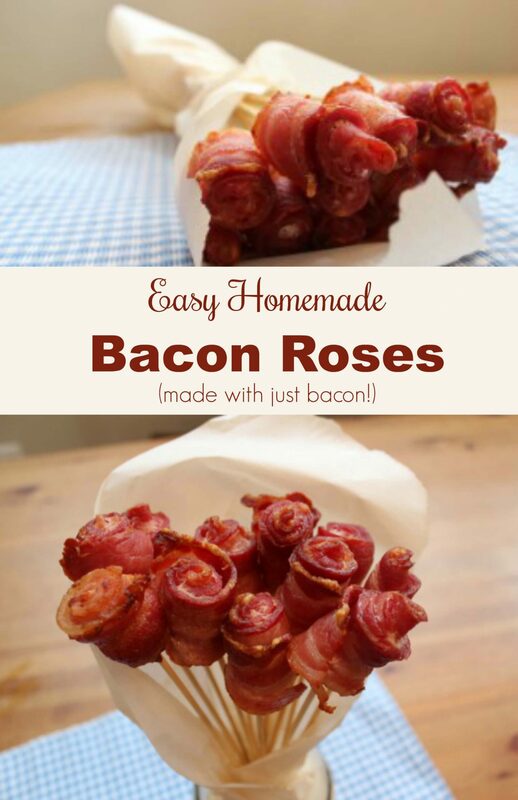 This sounds a little extreme, but these bacon roses are totally worth it. Also, mini muffin pans can be found inexpensively, AND you can still use them if you use liners. So, to get a hole in the bottom of each muffin cup, drill into the center, or hammer a nail through the center, with your piece of scrap wood under your muffin tin. Use your hammer to hit the sharp edges that you just made too, to prevent them from cutting you. You absolutely have to do this step or your roses won’t get firm enough to spear with your skewer. Wash your newly-holey muffin tin. 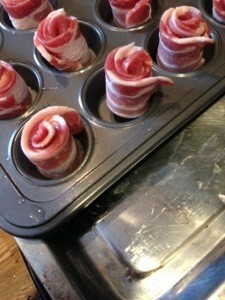 Roll up one slice of bacon into a tight spiral. Place it in the pan with the fat side down, the more-red side up. Repeat for the remaining 11 pieces of bacon. Place your filled muffin tin crosswise across your rimmed baking pan, so that there is space for the bacon grease to drain out. Bake for 30 minutes, checking after 20 minutes to make sure each cup has drained. If one hasn’t, use tongues to lift up the bacon rose, and the grease will drain right out. Continue cooking the last 10 minutes. Remove to papertowel to drain and cool. Once cool, use a skewer and poke into the center of the rose with the pointy end. Repeat with all roses. 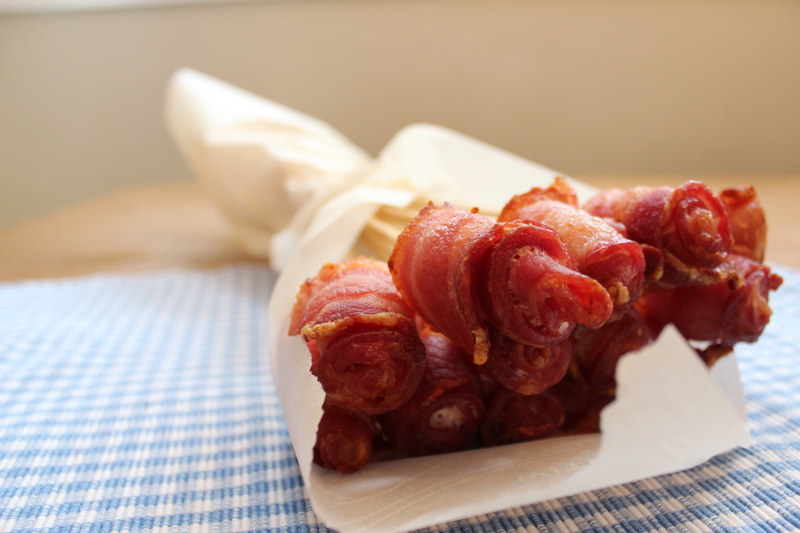 Wrap in parchment paper, or put in a narrow-neck vase and present them to your favorite meat-lover! 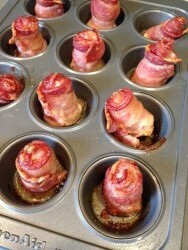 Once the muffin tin is prepped, these bacon roses are a snap to make. Make for your favorite meat-lover! So, to get a hole in the bottom of each muffin cup, drill into the center, or hammer a nail through the center, with your piece of scrap wood under your muffin tin. Use your hammer to hit the sharp edges that you just made too, to prevent them from cutting you. You absolutely have to do this step or your roses won't get firm enough to spear with your skewer. Bake for 30 minutes, checking after 20 minutes to make sure each cup has drained. If one hasn't, use tongues to lift up the bacon rose, and the grease will drain right out. Continue cooking the last 10 minutes.